In an article by Megan Garer, the portrayal of men and women in rom-coms is discussed. Her main point in this article is that rom-coms give the idea that if a man is interested in a women, he should incessantly pursue her because “the matter is not whether, but simply when, she’ll give in.” She discusses how this idea as well as deceit on the man’s part can be found in some of the most popular rom-coms and how this kind of notion is clearly a concern. Another thing she notes on is not just from the male’s portrayal, but also from the women’s portrayal in that she thinks that rom-coms exemplify women as “passive” in this whole pursuit situation. In another article by Saija Rankin, the topic of rom-coms and their effects on people, especially young people, is discussed. In her article she talks about the unrealistic expectations that rom-coms set and how these are perceived even worse by young people who don’t have the experience to understand just how unrealistic these expectations really are. Another important note that she makes is that “rom-coms also convey the illusion that self-fulfillment can only be found in an idealized romantic relationship.” She also goes on to discuss how instead of looking for a relationship with someone else, we should be looking for a “healthy relationship” with ourselves. Another article from Huffpost talks about how romantic comedies are “ruining love” for both men and women. 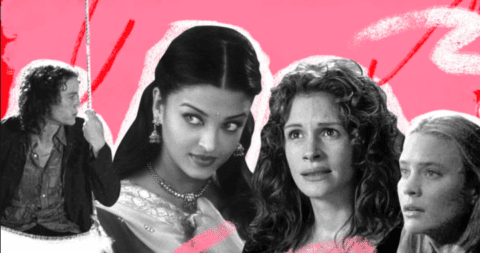 The reasoning that is offered for this is that these movies give women unrealistic expectations of men and in turn give men “big shoes to fill.” The article also notes that romantic comedies can give the impression that these whirlwind romances have to happen “organically” or they aren’t meant to be. Rom Coms by Kasandra is licensed under a Creative Commons Attribution-ShareAlike 4.0 International License.